Lesbos (Greece) (AFP) – Pope Francis on Saturday told despairing migrants trapped on the Greek island of Lesbos they were “not alone” and pleaded for the world to show “common humanity” following a dramatic hardening of the EU’s stance on migrants. The pontiff’s visit comes amid continuing criticism of a deal reached last month to end Europe’s refugee crisis by sending all irregular migrants who land in Greece back to Turkey. An official from Greece’s state refugee coordination agency said Francis, who has repeatedly spoken out about the plight of the migrants, planned to offer a small group of refugees a new life at the Vatican. Greek public television ERT said three families from Kara Tepe refugee camp on Lesbos, who were chosen in a draw, would be the ones to go. There were emotional scenes as the 79-year-old leader of the Catholic Church visited the Moria migrant registration centre where around 3,000 people are being held. 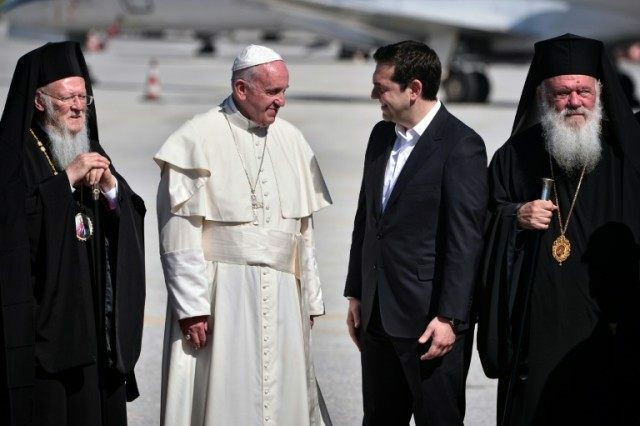 “You are not alone… do not lose hope,” the pope, who was accompanied by Ecumenical Patriarch Bartholomew and Archbishop Ieronymos, the head of the Church of Greece, told the migrants. One man broke into tears as he knelt at the pope’s feet, requesting his blessing. Another woman who slipped past security to approach the pontiff also broke down in tears as he paused to listen to her. Some held handmade signs that read ‘We want freedom’, ‘Let my people go’ and ‘Papa cherche a nous sauver’ (‘Pope, try to save us’). A group of small children presented the pope with a dozen drawings. Lesbos is one of the first ports of call in the EU for the hundreds of thousands of asylum-seekers who have fled war, poverty and persecution in the Middle East and Asia across the Aegean Sea via nearby Turkey in the past year. The religious leaders held a prayer at Lesbos harbour in memory of the hundreds of migrants who have drowned during the voyage in overcrowded smuggler boats. The pope stressed that migrants were not numbers but people with “faces, names and individual stories” who were preyed on by “unscrupulous thugs” and called for “resolute” efforts to clamp down on arms trafficking. “The world will be judged by the way it has treated you. And we will all be accountable for the way we respond to the crisis and conflict in the regions that you come from,” Bartholomew said. The refugee influx has sparked fierce disagreements between EU members and brought the bloc’s system of open borders to the brink of collapse. Lesbos has become the focus of criticism of the EU’s deal with Turkey to take back migrants who travel to the Greek islands, in return for billions in EU cash. All new arrivals on the island are being held at Moria while waiting to be processed to determine whether they can legitimately claim asylum or should be returned as “economic migrants”. Rights groups have accused Greece of turning the centre into a detention camp. Migrant flows to Greece have drastically fallen since the agreement took effect. The number of deaths in the perilous crossing have also been cut — though not entirely eliminated. The refugee families to be taken in by the Vatican are expected to be from those who arrived before the accord took effect in March, the Greek refugee agency official told AFP. It was not clear whether they would leave directly with the pope after his visit, or at a later stage. Francis had framed his visit as an exercise to raise awareness of the “worst humanitarian disaster since the Second World War”. The former Jesuit priest has repeatedly said he does not accept the EU’s distinction between those fleeing conflicts, like the war in Syria, and those fleeing poverty and starvation created by global economic inequalities. That line has been backed by Bartholomew, the Turkey-based leader of the world’s roughly 250 million Orthodox Christians, who said Europe as a whole must display the same generosity as the people of Lesbos. On a 2013 visit to Lampedusa, the Italian island which has witnessed several deadly sinkings of migrant boats off its shores, the pope made one of the defining speeches of his papacy, denouncing the “globalisation of indifference” which has allowed thousands to perish at sea. Over one million people crossed clandestinely from Turkey to Greece in 2015 and some 150,000 have made the trip since the start of this year.